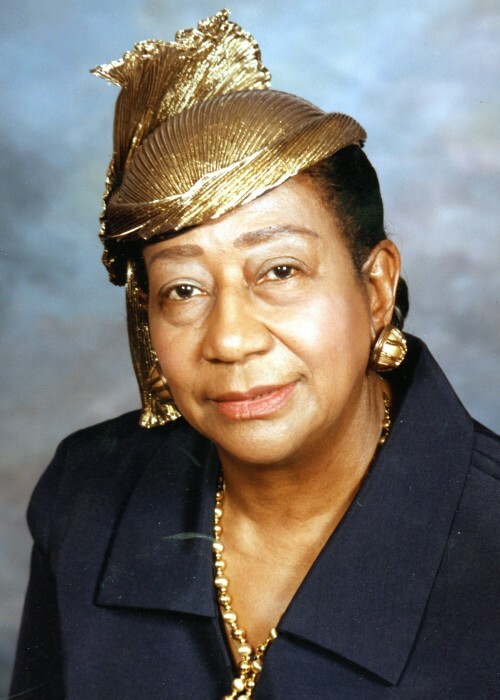 Obituary for Bertha May Lenix | Frank R. Bell Funeral Home, Inc.
Bertha Alston Lenix was born on April 6, 1927 in Warrenton, North Carolina, to the late Anthony Alston and Willie Lillian Baker Alston. She transitioned to the heavenly palace on February 3, 2019. She was preceded by the love of her life, her husband of 22 years, Dennis Lenix who has waited patiently for the arrival of his love. There is no doubt that a bright star was shining on her entry into this world because she lived a long and exciting life. Most people didn’t know that in her mid-twenties, she was diagnosed with breast cancer and was given a fatal diagnosis that she would not survive past her twenties. But we know who has the last word and her faith in the Lord allowed her to live beyond all her siblings. She was truly a survivor and continued to be an inspiration to others. She never thought that she would be able to claim the title of a nonagenarian, but by God’s grace and mercy, she achieved that milestone. She traveled the world to various parts of Europe, including her favorite place in Paris, France; she cruised multiple islands in the Caribbean and traveled across the nation visiting most of the United States. She attended and graduated from Hawkins high school in North Carolina and completed two years of college at the Elizabeth State Teachers College. Her thirst for education and religion was rooted in the embedded principles instilled by her mother Willie who was a teacher and who also taught Bible school. When Bertha moved to New York City to seek employment opportunities, she worked at the Brooklyn Navy Yard, as a reception for a large real estate firm, and a bookkeeper for Lewis Vacuum Cleaner Company. Although employment opportunities were an easy acquisition for her, she still had her dream of opening a beauty salon. Therefore, she enrolled into the La Roberts Beauty School to pursue her dream of becoming a hair stylist. After graduation, she worked in a small beauty shop for almost a year until she was able to save enough money to open her own business. In addition to her initial training at La Roberts, she took special courses to improve her skills at Rerdu Beauty School and Wilfred Beauty Academy in New York. She maintained a successful business for 37 years until she felt it was time to retire and sold her business. Although she did not have any biological children, she loved her nieces and nephews as her own. She relied heavily on her niece, Dr. Rita D. Strickland who maintained a close relationship with her, particularly during her latter years. She also had a “God daughter” who shared her same name, Bea Moore. She also leaves to cherish her memories are her nephews, John R. Stith, Jr, of Printess, Mississippi, Theodore Stith of Henderson, North Carolina, her niece Gail R. Lacey of Orange, New Jersey, Maxine Boone, Juanita Tate and Paul Alston Jr. of Las Vegas, Nevada Jr., many grand nieces and nephews, other family members and a multitude of church friends.